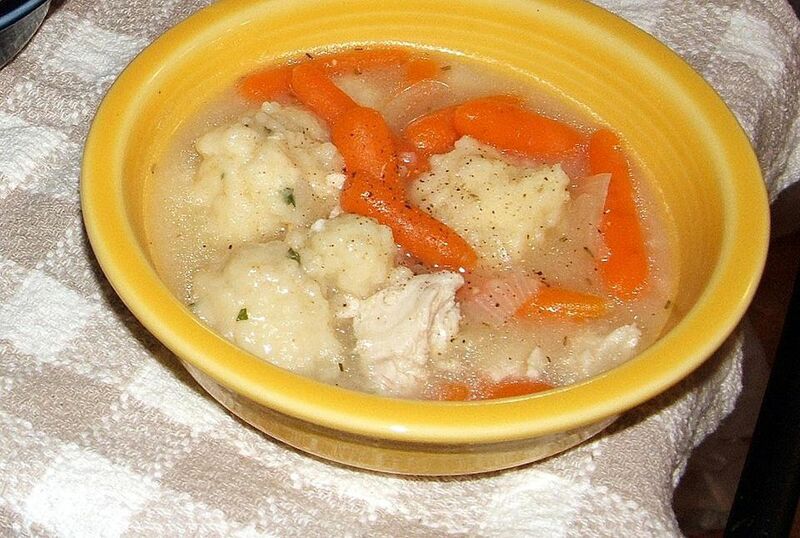 This recipe for chicken and dumplings was shared by Liz. This version of the classic dish is made with easy parsley dumplings. Place chicken in stock pot. Add enough water to cover. Add parsley, celery, carrot, onion, 2 teaspoons salt and 1/4 teaspoon pepper and bay leaf. Cover and bring to a boil; simmer for about 2 1/2 hours. Combine 1 cup flour, baking powder and remaining 1/2 teaspoon salt in a medium bowl. Combine milk and melted shortening. Add to the dry ingredients, along with the chopped fresh parsley. Stir just to moisten dry ingredients and drop by tablespoon directly onto the chicken in the boiling broth. Reduce heat without lifting cover and simmer about 15 minutes. Measure 4 cups of broth into saucepan. Combine remaining 1/2 cup flour with cold water; stir until smooth. Gradually add flour mixture to broth, stirring constantly. Cook, stirring, until thickened.